A Russian public movement called "Novorossiya" (New Russia) provides help for the rebels in eastern Ukraine and is now on the EU sanctions list. Mr Strelkov (real name Girkin), a Russian citizen, came to prominence last April, when he led a group of pro-Russian fighters into the east Ukrainian city of Sloviansk. That was the trigger for the large-scale armed uprising against the Kiev authorities in the east. 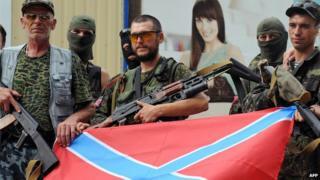 Mr Strelkov is based in Moscow now and Novorossiya provides humanitarian aid to the rebel-held regions. The EU says the movement "helps militia fighting in eastern Ukraine, thereby supporting policies undermining the territorial integrity, sovereignty and independence of Ukraine". Mr Strelkov had already been put on the EU and US sanctions blacklists last year. Mr Strelkov's deputy, Igor Ivanov, believes the EU move is pointless. "It is ridiculous to treat our organisation, which supplies warm clothes, food, medicines, in the same way as you would treat a military unit. "Also, sanctions cannot work in practice. We are a civil society movement, we have tens of thousands of members who bring donations to our collection points. Our members are civilians. We organise campaigns among schoolchildren and church parishioners. Can the EU sanction all Russian schools or churches? Obviously, it's a joke," he told the BBC. However, Mr Ivanov did not deny that the movement helps rebel fighters, as well as civilians. In fact, he believes there is no distinction. The movement has representatives in several large Russian cities and a network of collection points. Its supporters include conservative Orthodox Christians, nationalists and monarchists. Mr Strelkov is an outspoken critic of corruption in the rebel-held areas and says he personally monitors distribution of Novorossiya aid, to make sure it reaches the right people.